Workers of the Port of Spain City Corporation load relief items including mattresses and foodstuff on a truck en route to the Greenvale community of La Horquetta yesterday. AS MOST of the damage caused by last weekend’s floods affected rural areas of Trinidad, the Port of Spain City Corporation and all other municipal corporations have released their disaster units to assist those within and outside of their jurisdictions. Relief efforts continued yesterday from City Hall with goods – such as mattresses and cleaning products and equipment – being loaded into the corporation’s trucks for distribution to two shelters in La Horquetta – one of the worst affected areas. The corporation, said mayor Joel Martinez, has allocated its equipment, vehicles and manpower to assist the worst-affected areas. Martinez said staff from his corporation’s central and eastern divisions were specifically assigned to areas in the eastern region as part of co-ordination efforts overseen by the Office of Disaster Preparedness and Management (ODPM). 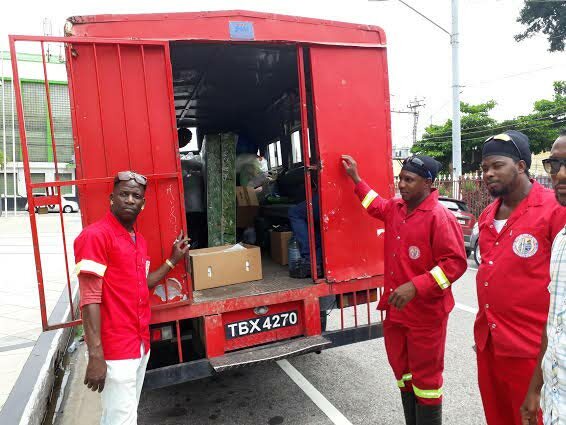 When Newsday visited City Hall yesterday, workers were loading the trucks as they continued distributiing supplies to shelters in La Horquetta North and South. Over the weekend, the corporation assisted Sangre Grande, Arima and environs. Martinez, in an interview, confirmed that relief items have been donated by corporate and regular citizens, and continued to be distributed yesterday to the community of Greenvale, La Horquetta. The corporation itself has also provided relief in the form of manpower and equipment. “We have a disaster co-ordinating committee, which rolled into action when the floods (started). So what happened was, that co-ordinating committee would have had a number of people on standby to come out and operate when there is a pending disaster. “Now although Port of Spain was spared for the moment, we have neighbouring municipalities that would have been affected, as you would know: La Horquetta, Greenvale, Kelly Village, Caroni, etc. Reply to "PoS sends help to flooded areas"